Don't be tempted by this extremely high yielder, which is flashing all sorts of warning signs. Freeport Gulf of Mexico. Source: Company website. 2014 was a very bad year for energy and materials companies. The price of crude oil fell by about half in the span of a few months, from over $100 per barrel in the United States all the way down to its current level of around $50 per barrel. Separately, precious metals prices fell in tandem, and continued to drop to start 2015. Copper fell to a six-year low in January to $2.52 per pound, before recovering slightly since then. Both oil and precious metals like copper have plunged based on widespread fears of a global commodity supply glut. As a result, any company in the oil or precious metals businesses suffered greatly last year. A company involved in both areas is in particularly bad shape, and that's exactly the position Freeport-McMoRan (NYSE:FCX) is in. Many companies in the energy and materials sector have cut their dividends in recent weeks because of the horrible operating climate. Freeport McMoRan is not immune, and its tantalizing 6.6% dividend is in more danger than investors might think. Because of the commodity crash of 2014, Freeport lost $2.9 billion just in the fourth quarter. For the full year, the company lost $1.3 billion. Clearly, it goes without saying that a company can't continue paying a dividend if it isn't profitable. Freeport management is taking a number of actions to batten down the hatches during the commodity carnage. The company is cutting 2015 capital expenditures by $2 billion. But this is likely not going to generate enough cash. Freeport generated $5.6 billion in operating cash flow, but spent $7.2 billion in capital expenditures. Its capital budget bloated last year, due primarily to the decision to spend $3.2 billion on its oil and gas operations, a significant increase from $1.4 billion in oil and gas spending the previous year. Because of this, Freeport was free cash flow negative last year to the tune of $1.5 billion. 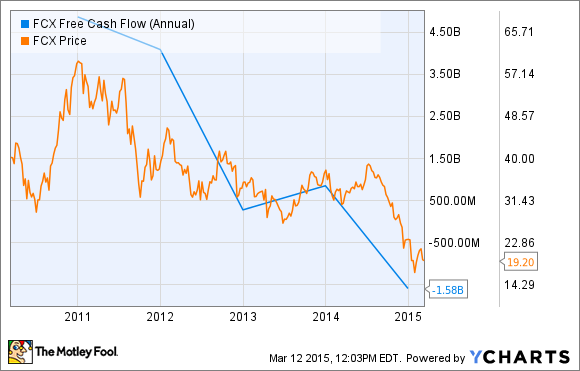 FCX Free Cash Flow (Annual) data by YCharts. Cutting spending by $2 billion barely gets Freeport's head above water, let alone tackles its dividend requirements. Freeport's $1.25 per share annual dividend costs the company approximately $1.3 billion in cash. In 2015, Freeport expects to generate $4 billion in operating cash flow, based on its current production forecasts. But even after cutting capital spending by $2 billion, Freeport still expects to spend $6 billion on capital expenditures this year. That means Freeport will be free-cash-flow negative by about $2 billion. This means if commodity prices don't recover soon, something has to give to preserve the dividend. Normally in this situation, a company would turn to the debt markets to try to raise money, if it wants to preserve its dividend. But Freeport doesn't have this opportunity, because it's already loaded up with debt. At the end of last quarter, Freeport held over $18 billion in long-term debt. The company's balance sheet is bloated, directly as a result of its major push into oil and gas in the past couple of years. The company spent $19 billion on acquiring Plains Exploration and McMoRan Exploration in 2013. This saddled the company with a lot of debt at just the wrong time, as Freeport was blindsided by the collapse in oil and gas prices. It goes without saying that 2014 was a bad year for energy and materials companies. In commodity businesses, profits are highly dependent on the underlying prices of the commodities themselves. Precious metals and oil both got hammered last year, which caused stock prices across the energy and materials sectors to collapse. Because of this, Freeport's dividend is at risk. On the company's fourth-quarter conference call, management stated it would take action on the dividend if it were necessary to rescue the company's financial position. Investors may recall that Freeport faced a similar environment in 2008 when commodity prices collapsed, and it suspended its dividend for almost two years. In the stock market, there's usually more to a dividend yield than meets the eye. Investors may be lured in by Freeport's sky-high yield, but this looks like a classic yield trap.